Future shock? How badly is cyber-hacking nibbling away at our infrastructure? 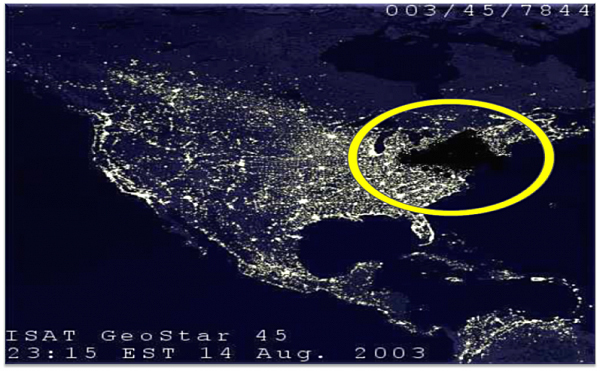 I don’t know about you, but I’ve never forgotten the late afternoon of August 14, 2003 when problems with the North American power grid meant that people in eight states stretching from New England to Detroit suddenly found themselves without power. Fortunately, my company’s Maryland offices were situated about 100 miles beyond the southernmost extent of the blackout. But it was quite alarming to watch the power outage spread across a map of the Northeastern and Great Lakes States (plus Ontario) in real-time, like some sort of creeping blob from a science fiction film. Another (happier) thing I remember from this 15-year-old incident is that rather than causing confusion or bedlam, the massive power outage brought out the best in people. This anecdote from the blackout was typical: Manhattanites opening their homes to workers who couldn’t get to their own residences for the evening. For most of the 50 million+ Americans and Canadians affected by the blackout, power was restored after about six hours. But for some, it would take as long as two days for power restoration. Upon investigation of the incident, it was discovered that high temperatures and humidity across the region had increased energy demand as people turned on air conditioning units and fans. This caused power lines to sag as higher currents heated the lines. The precipitating cause of the blackout was a software glitch in the alarm system in a control room of FirstEnergy Corporation, causing operators to be unaware of the need to redistribute the power load after overloaded transmission lines had drooped into foliage. In other words, what should have been, at worst, a manageable localized blackout cascaded rapidly into a collapse of the entire electric grid across multiple states and regions. But at least the incident was borne out of human error, not nefarious motives. That 2003 experience should make anyone hearing last week’s testimony on Capitol Hill about the risks faced by the U.S. power grid think long and hard about what could happen in the not-so-distant future. The bottom-line on the testimony presented in the hearings is that malicious cyberattacks are becoming more sophisticated – and hence more capable of causing damage to American infrastructure. The Federal Energy Regulatory Commission (FERC) is cautioning that hackers are increasingly threatening U.S. utilities ranging from power plants to water processing systems. Similar warnings come from the Department of Homeland Security, which reports that hackers have been attacking the U.S. electric grid, power plants, transportation facilities and even targets in commercial sectors. The Energy Department goes even further, reporting in 2017 that the United States electrical power grid is in “imminent danger” from a cyber-attack. To underscore this threat, the Department contends that more than 100,000 cyber-attacks are being mounted every day. With so many attacks of this kind happening on so many fronts, one can’t help but think that it’s only a matter of time before we face a “catastrophic event” that’s even more consequential than the one that affected the power grid in 2003. Even more chilling, if it’s borne out of intentional sabotage – as seems quite likely based on recent testimony – it’s pretty doubtful that remedial action could be taken as quickly or as effectively as what would be done in response to an accidental incident likr the one that happened in 2003. Put yourself in the saboteurs’ shoes: If your aim is to bring U.S. infrastructure to its knees, why plan for a one-off event? You’d definitely want to build in ways to cause cascading problems – not to mention planting additional “land-mines” to frustrate attempts to bring systems back online. Contemplating all the implications is more than sobering — it’s actually quite frightening. What are your thoughts on the matter? Please share them with other readers.